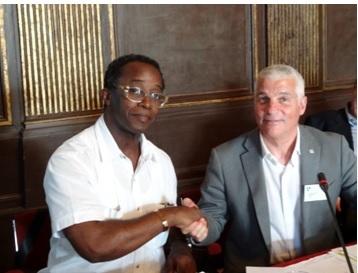 On the occasion of its General Assembly, which took place on 24 April 2014 in Padova (Italy), the Architects Council of Europe signed a Memorandum of Understanding with the Africa Union of Architects, represented by its President, Mr Tokunbo Omisore. 7. And finally, to undertake to establish and concretely define a closer cooperation at political, technical and working levels. Both Organisations commit themselves to preparing a Mutual Recognition Agreement that will set the rules for their respective members to practise on the two continents. Read the complete text of the Memorandum of Understanding on the ACE website. Unser Doppelsymposium widmet sich zwei Themen: der “Region der Zukunft” in einem breit zugänglichen, öffentlichen Forum über nachhaltige regionale Raumentwicklung; und dem Thema “Business von Heute”, einem B2B-Ereignis für Unternehmen, Nutzer, Investoren und Medien aktiv in nachhaltigen Produkten und Dienstleistungen, unter der Schirmherrschaft des EU Alpine Space Programms. Am Abend des 06. Juni wird das Resultat des diesjährigen Zurich Klimapreises vorgestellt, und die Ausschreibung für die nächste Runde angekündigt. Our twin symposium is focused on two critical themes: the “Region of Tomorrow” in a public forum aimed at sustainable and responsible regional development and the topic Theme “Business of Today”, a networking event for entrepreneurs, investors, users and media representatives active in sustainable products and services, under the patronage of the EU Alpine Space Program. 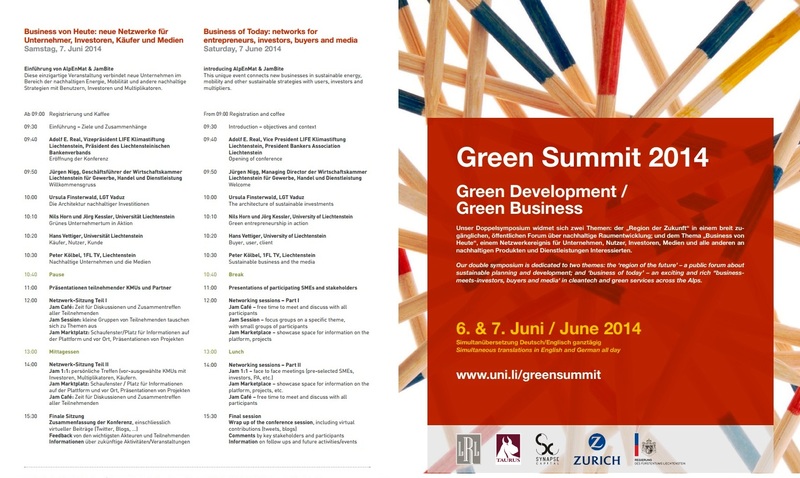 On the evening of 6 June 2014 the Zurich Climate Price will be presented. Cultures, meanings and landscapes in transition. What makes the LE:NOTRE Landscape Forum different from other European landscape events is the focus on interdisciplinary dialogue, debate and discourse. It provides a unique opportunity to interact creatively with colleagues from a range of landscape disciplines in informal workshop and field visit settings. A joint ISBN publication will result from the meeting, to which all participants will contribute. The LE:NOTRE Institute and our hosts at the Faculty of Forestry of the University of Sarajevo look forward to welcoming you at the 3rd LE:NOTRE Landscape Forum in Sarajevo. The registration deadline is May 2nd 2014! For more information visit the LE:NOTRE Institute Landscape Forum 2014 web site. Parce que 9 français sur 10 considèrent le végétal comme essentiel pour leur équilibre quotidien, que ce soit chez eux, au travail ou dans les lieux publics ; depuis 2008, les Victoires du Paysage ont à coeur de valoriser les démarches paysagères des entreprises et des promoteurs immobiliers. En 3 éditions, 12 entreprises ou promoteurs immobiliers tels que Vinci Immobilier Résidentiel, Nexity Foncier Conseil, Novotel, Banque Populaire Occitane, Société des Bains de Mer…ont été récompensés pour des aménagements paysagers remarquables. Offrir à des salariés un cadre de travail de qualité, donner vie et qualité à un éco-quartier, donner de nouvelles perspectives à un hôtel devenu hôtel de luxe grâce au paysage, transformer un domaine en l’adaptant à ses nouvelles fonctions touristiques, etc… tel est le pari gagné de ces entreprises ! De plus en plus d’entreprises et de promoteurs immobiliers prennent en considération le végétal et intègrent dans leurs projets une véritable démarche paysagère, mais beaucoup reste encore à faire ! Parmi les lieux manquants le plus cruellement de vert sont cités les centres commerciaux (86%), les lieux de travail (65%) et les lieux d’habitation (50%). Ce mois-ci, la Lettre des Victoires du Paysage va s’attacher à montrer que le végétal est indispensable et indissociable des projets d’aménagements de ces maîtres d’ouvrages privés. Vous souhaitez rejoindre le prestigieux palmarès des Victoires en valorisant un projet d’aménagement remarquable améliorant le cadre de vie ? Inscrivez-vous sans tarder, avant le 15 juin 2014, sur www.lesvictoiresdupaysage.com. The Municipality of Asunción, the Ministry of Public Works and Communications, the National Secretariat of Culture, the National Administration of Navigation and Ports, the Chamber of Deputies of the National Congress convene teams or professional service companies related to urban discipline, national as well as international, to THE INTERNATIONAL CONTEST OF IDEAS FOR THE DEVELOPMENT OF THE MASTER PLAN OF INTERVATIONS IN THE FRAMEWORK PROCESS OF REVITALIZATION OF THE HISTORIC DOWNTOWN OF THE CITY OF ASUNCIÓN, capital of the Republic of Paraguay. The international contest of ideas counts with the technical advice, the organization and management from the School of Architects of Paraguay/Regional Capital through the Inter-institutional cooperation agreement subscribed in Asunción, on January, 2014. The proposals will be received from Monday, July 14 until Saturday, July 19, 2014, between 9:00 and 12:00 hrs. local time in Asunción, at the headquarters of the Ballario House, located in la Manzana de la Rivera, O´Leary Street and El Paraguayo Independiente, Asunción. The registration of the proposal submission will close at 12:00 noon on Saturday, July 19, 2014, not being able to accept any proposal that is submitted after the established time and date. It is hereby established to award contract of US$ 100,000 (One hundred thousand US. dollars) for the winner of the contest; the amount of US$ 8,000 (Eight thousand US. dollars) for the second, and US$ 6,000 (Six thousand US dollars) for the third finalist, and honorable mentions for the 4th and 5th place. The proposals will be evaluated by members of the jury, as set forth in the request for proposal. The contest seeks to obtain the best proposals to serve as guidance in order for Asuncion to recover its coastal city vocation, revitalized with new population living in the historic downtown area, with productive economic options as in the cultural area as well as in technology, tourism, and others, to make it sustainable, environmentally friendly and respectful of its historic legacy. Registration takes place in the website of the contest www.colegiodearquitectos.org.py and/or www.asuncioncentrohistorico.com and it is open until June 23, 2014. The request for proposal and additional information are available on-line. The official language of the contest is Spanish.